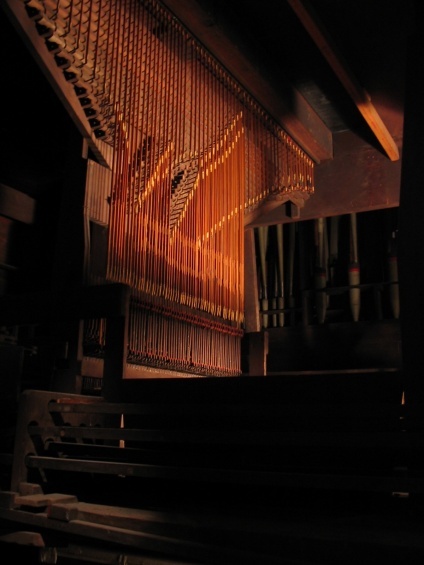 In the mid-nineteenth century, pipe organs were a symbol of America’s growing technological and cultural progress. Thousands of people would attend a new pipe organ installation in a church, and newspapers would rave about a new instrument’s power and innovative capabilities. Built before electricity was available, the magnificent 1868 Henry Erben is the last large, three-manual Erben organ, and one of only a few from the era left intact with its original voicing and mechanical action. This performance turns the magnificent Erben organ inside out, allowing the audience to see the interior mechanisms of the pipe organ projected on the walls of the Old Cathedral. Video cameras are placed inside the monumental organ, and the movements of the organ’s sculptural mechanisms are projected onto the architecture of the centuries-old Basilica. The audience, immersed in sound and light, experiences one of the few remaining examples of what New Yorkers were listening to before the invention of recorded sound. This pipe organ has propelled a renaissance in music-making at the Basilica, taking listeners to new spiritual and intellectual heights.